INDIANAPOLIS -- Two former members of the U.S. House of Representatives will visit Indiana University-Purdue University Indianapolis Sept. 25-27 for a Congress to Campus event to engage students and provide inspiration intended to lead to greater democratic participation. The visit of Bill Enyart, a Democrat from Illinois, and Ron Sarasin, a Republican from Connecticut, was arranged through the Congress to Campus program of the U.S. Association of Former Members of Congress. It is being presented by the Richard M. Fairbanks School of Public Health, the Lilly Family School of Philanthropy, and the School of Public and Environmental Affairs. The congressmen will share their personal experiences, offering a candid insider's look at the workings of American government and politics to illuminate the democratic process and the inner workings of Washington. The bipartisan pair will interact with IUPUI faculty and students and engage with alumni and community partners. They will also participate in a town hall that is open to the public as well as the campus community. It will take place at 1:30 p.m. Sept. 26 in the Lilly Auditorium, located on the lower level of University Library, 755 W. Michigan St. At the town hall, Enyart and Sarasin will discuss the importance of civic engagement and urge voter involvement in political decision-making. Enyart, an attorney, served in the U.S. Air Force before joining the Illinois Army National Guard in 1982 as a JAG officer. As adjutant general of Illinois, he led the largest deployment of the Illinois National Guard since WWII and Illinois' response to the 2011 Mississippi River floods. He retired from the military in 2012. Enyart was elected as the U.S. Representative for the 12th Congressional District of Illinois in 2012; he served one term in Congress. Sarasin served three terms in Congress, representing Connecticut's 5th District until 1978, when he ran unsuccessfully for governor of Connecticut. Before that, he was a two-term representative in the Connecticut General Assembly and an attorney. Since 2000, Sarasin has been the president and chief executive officer of the United States Capitol Historical Society, a nonprofit, nonpartisan educational entity chartered by Congress to enhance and perpetuate the history and heritage of the Capitol, its institutions and the individuals who have served there. 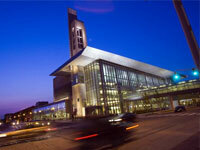 The event marks the second Congress to Campus event at IUPUI. The first took place in 2013. Congress to Campus event aims to increase democratic participation.